If you have ever been to a traditional led Ashtanga class, you will have undoubtedly noticed—and were perhaps even mesmerized by—the tempo of the Sanskrit1 count, the melody of the asana2 names spoken in the same native tongue, the hum of your own breath. It is this illusory, intangible rhythm where I, too, rest my focus when I’m teaching. In fact, sometimes I teach with my eyes softly closed, although only after I’ve ensured that you’re established and safe in the asana or sequence. It’s not that I’m unconcerned with your posture. In fact, I am. Very much so. But if I focus too much on it, I will get in the way. And so will your mind. There is something that happens in between the poses, the breath and the gentle count of Ashtanga vinyasa. A sort of transmission that takes place through my voice, my hands, the energy of your fellow practitioners, and eventually, as you learn the practice, directly through you. In a sense, even as your teacher, I am not here to teach you. I am here to hold the space that allows the practice to do the teaching. 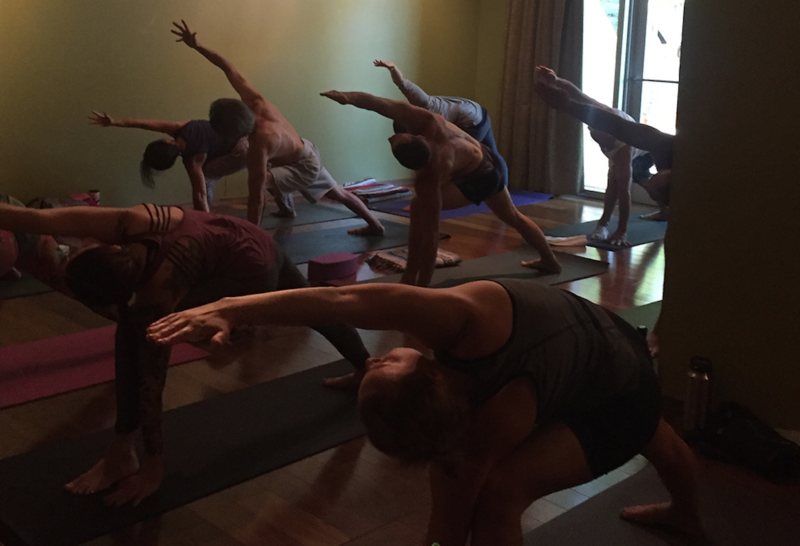 As the class moves and breathes together, we entrain ourselves to the rhythm of the practice. This rhythm is what lulls you deeper and deeper into yourself, where your body provides all the teaching that you need. Then you become your own teacher. Most Ashtanga vinyasa teachers choose not to play music. Despite this, to me, the felt sense of the practice is that of a song, beginning and ending with the same chants that have been sung by practitioners for nearly 100 years and, in between, the flow of body and breath that inspires a most hypnotic and entrancing dance. No need to know the dance already. The more you come, the more you will see that it is already within you. Kari Ann Levine offers Ashtanga at Urban Yoga Saturdays at 8:30 am and, beginning August 2nd, on Thursdays at 6 pm. She’s also the designer behind the Sacred Vagabond line of inspired jewelry creations for the spiritually inclined which you’ll find in the Urban Yoga Boutique. You can learn more about Kari by reading her full bio. In addition to Kari’s class on Saturday mornings, Urban Yoga offers Ashtanga on Tuesdays and Thursdays at 6 pm and Sundays at 8 am.